This article was originally from Statsman, Practical Punting. We want to share it with our customers to help them have a better betting experience. How important are barriers when accessing the form? This article will examine what to look for with regards to the fastest way home for a horse! 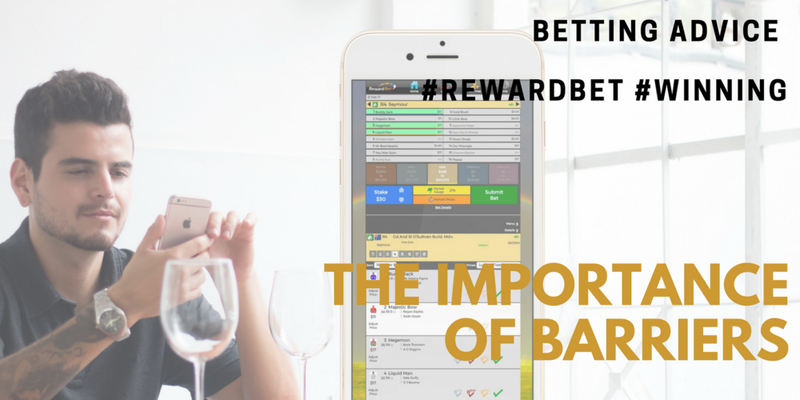 So now we get back to barrier draws, and their importance in racing, and more importantly their importance as far as form study and analysis is concerned. You can't get away from the fact that for a great percentage of races it's better to be drawn closer to the rails. The race percentages themselves show that most races are won by horses coming from the 10th gate inwards. Yet such a statistic is only helpful up to a point because each race is a different 'ball game' with different horses of different ability and pace. By this, I mean that few punters give much attention to weighing up the possible scenario of how a race will be run-which horse will lead, which horses will sit just behind the pace, which horses will get trapped wide, which ones will drift back and then have to make ground late? These are some of the issues which have to be addressed if you are to get a clear picture in your mind of how a race is likely to be run. You can do a simple test yourself if you need convincing. Make a drawing of a racecourse with the backstretch and the home straight taken away, and only the turns remaining. The turns butted together form a circle. We will say this circle is 800m in circumference. Start one horse around this circle running against the rail and another horse in the middle of the track, or about 15m from the rail. If both horses run at exactly the same speed the outside horse will be about 43 lengths behind at the finish. It is surprising, then, to discover how little distance a horse can run out from the rail to show an enormous effect on the result of a race. Take the case of the rails runner in this example. Send him around the circle and hold him close to the rail and at 12 seconds to 200m he will run 800m in 48s. Run him at exactly the same speed but 4m from the rail and his time for 800m will be 49.5s. And remember-a horse running 4m out from the rail is not doing anything unusual but is duplicating a circumstance that happens all too frequently in real races. Travelling one metre extra works out to be equivalent to 0.36 lengths which means a horse covering 4.5m extra would be about 1.5 lengths worse off, with 9m extra being covered, equivalent to about three lengths. Professional punting 'king' Don Scott goes into great detail about wide runners, and barriers, in his best-selling book, Winning More. Indeed, one of his main 'maxims' in a raceform study is the following: Some outside barrier positions are a disadvantage ... this disadvantage can be expressed in kilograms'. Now we are getting to the nitty-gritty of the subject. Says Scott: "Although an outside barrier position tends to be a disadvantage, it is often not as great as some punters believe ... Some experts produce statistics showing that most winners start from inside barriers. These stats give a false picture since the inside barrier positions are always occupied in every race while the outside positions are occupied only when fields are large. "While some punters refuse to back horses drawn wider than 8, 12 or 15, depending on the fanaticism of their opinion, I have backed scores of winners drawn out in no man's land. One of the most memorable was Citadel at 100/1 in the 1974 Epsom." Scott dissects each major city and provincial track, in all States, and allows various penalties for horses racing from wide barriers. If you use these, in conjunction with your own knowledge about a horse, you should be able to accurately 'track' how much a barrier will affect any individual horse. Always remember then that barrier draws are important - but don't get carried away with an all-embracing rule about them. Treat each case on its merits. Wide draws can be fatal-but not all the time. And, as for wide running on the turns, remember that horses DO cover more ground when doing so, so think about compensatory form allowances for it.